Think about it. People love a garden. They drive for miles to visit parks so that they can enjoy the luscious green and sniff that fresh air. Botanical gardens in nearly every major city and plenty of smaller ones attract thousands of visitors each year yearning to gaze upon the beauty of the flowers. (Millions on the days I’m there!) People are instant friends with vegetable gardeners in their offices who bring in baskets of their bounty to share. (“Zucchini anyone?”) They buy gardening magazines by the bazillions. They’ll slow down as they drive by to admire the gardens they pass on the way to work. And although most folks dutifully march outside to mow the lawn on Saturdays and maybe even do a bit of weed whacking to keep the home owners’ association Nazis at bay, few people actually rush home from work to deadhead their dahlias and turn their compost. I’m talking about creating the kind of garden that makes people want to linger. At least not the people that I know. So why don’t more people actually create their own oases of beauty at home? I used to believe one of the biggest hurdles for most people is time. The desire is there, but most folks just can’t seem to work it into their schedules because we’re just too darned busy working to buy things. After all, the time gurus tell us that as Americans, in particular, we are possession rich and time poor. But wait a minute. Think about this little nugget from the 2006 Time Use Survey conducted by the Bureau of Labor Statistics. On an average day, nearly every American age 15 and older–a whopping 95%–had several hours of leisure activity. Men had 5.7 hours of leisure time and women had 4.9 hours of leisure time. (I won’t even go into that glaring disparity right now.) That’s every single day. But for both men and women, half of that leisure time activity was spent watching television! That means that most U.S. men and women are spending close to three hours of time watching television every single day! Well, that explains it. Or at least part of it. Sure, not everyone is as hepped up to sweat in the sun while ruining their manicure as I am. And not everyone has the space to garden. Some people are not able to manage the physical demands of gardening. A whole lot of people have no idea even how to get started since most of us no longer live near the grandparents, great grandparents, aunts and uncles who were traditionally our garden mentors. And I recognize that gardening on a grand scale can be costly, although there are plenty of budget alternatives to beautify the yard. But for quite a lot of people, it’s mostly a matter of preferring to watch “American Idol” or “Dancing With the Stars.” Ultimately, it seems, Americans are making choices to tune out rather than to engage and create beauty right outside their own backdoors. Sadly for them, these choices won’t amount to much at the end of their days. Our lives are defined by the choices we make. Some of us will know all the winning strategies to be the “Survivor.” And some of us will have lovely gardens, islands of peace, to share with friends and loved ones. I love this article. This is what I wonder about all the time. It’s crazy to read the statistic on how much leisure time we have and how much we spent of it watching tv. I wish I had been introduced to this at a younger age and I would have learned and loved gardening even more. I think even those with a small space can still garden. I live in an apartment and do container gardening and volunteer when I can so I can actually dig in the dirt and tend the public gardens. It varies a great deal depending on where you are in the country. I found everyone gardened back east, few people do here in Texas. People often ask us how we have time to do (fill in the blank) and our answer is often that we just don’t watch TV. I think though that many are just intimidated by the amount of gardening info. out there and their lack of “know how”. Gardening wisdom was passed down from grandparents and parents to children not so long ago. I was lucky to have that advantage with avid gardening parents and grandparents. I knew the names of flowers as a toddler – but most of my friends didn’t grow up with that exposure to gardening wisdom from a young age. Even with that background I still find myself feeling a bit lost and overwhelmed at times! There’s a huge learning curve involved. People feel so sorry for my husband. He hauls composted leaf mulch for me one week out of the year. I work in the garden 6 months out of the year–but they feel sorry for him..why? Cause he hates it and I love it. Most people don’t do it cause it’s hard work. They think we are nuts but they always tell us how pretty it is. I guess I’m not making the best use of my leisure time because about the only TV I watch is 1 hour of news from 5:30-6:30. I suppose if I added up my knitting time though…..I could easily spend 4.9 hours every day being leisurely. P.S. Your gardens look great Robin! I’m so jealous of all that beautiful lettuce already. I love being countercultural, don’t you? 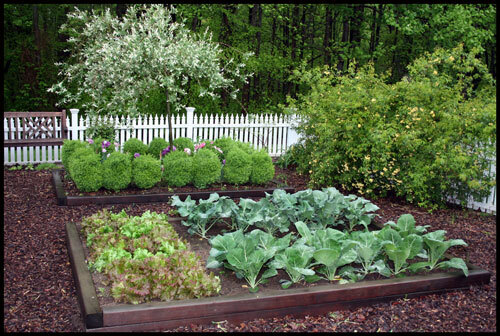 BTW, your veggie plot is lovely. People only like to sweat when they are in a gym where other people can see how well they sweat! That is what I have observed! 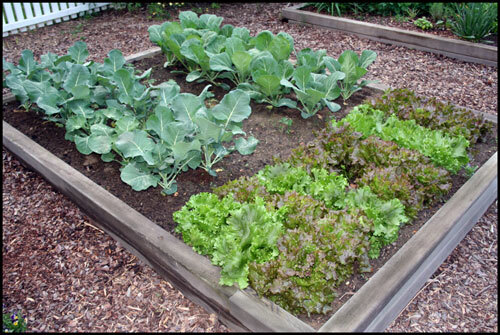 Your veggie plot looks good enough to eat! Well, I must be doubly crazy – not only am I a totally avid gardener/composter/landscaper at home, I also do it for a job. Lucky me! I love to tell people I don’t have t.v. – I feel so virtuous! But even with all that extra time on my hands my own garden is a little neglected sometimes. I have to remind myself that even after a day of it at Bwold, my garden is a relaxing oasis (of weeds) and I can do whatever I want in it/to it. And I think Amy is right – there’s so much information out there that gardening can seem like something you need an engineering degree to do rather than just a sense of adventure and a willingness to get a little dirty. Hi Robin, thanks for a thought provoking post. While we love to garden, I personally wish I could do it 24 hours a day, there are others with equal passions. My husband loves to golf, other men might like fishing or woodworking. It is the passion that counts, and we are so lucky that our passion is gardening! I think this is an intriguing question. I have asked myself this many times. I hate tv so I guess gardening helps me make it through the growing year and blogs have filled a hole in the winter gardening scene. I like tv, but it’s just on in the background. I enjoy working on photoshop and playing around with the pictures I’ve taken. And visiting blogs. My husband is the gardener and I usually will go out and help weed or whatever he wants. I have some flowers and I keep the edges of the house nice, but we don’t own our place so I haven’t spent much money on plantings. Yes, our lives are defined by the choices we make. I love the pictures of your gardens, Robin. Simply wonderful. I guess you can do like my husband…..he got a flat screen for the gazebo area so he can help me garden without missing his Yankee games……..I shouldnt have surfed in, now I have severe garden envy..its gorgeous! I think sometimes it’s a matter of inspiration people come across. If there aren’t good gardens or nurseries close by, people don’t get excited by the possibilities. 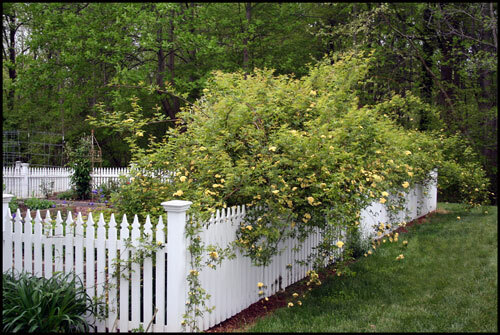 I like when you drive through a neighborhood close to a good nursery, a higher percentage of houses nearby have interesting gardens, and you see the gardens transition into plain old yards with distance. Actually, yes, how much time and money it takes for you to have such a gorgeous garden? This post is thought provoking – thank you. Quality of time spending is a global matter. It is similar probably in many countries. Poles according to recent survey, are watching TV on average 4 hours a day! TV and internet glues people to screens. How much? Enough. I could use more. And more. And more. I loved your post because I get people all the time saying, how do you have time to garden (I work full-time), and then in the same breath they ask if I saw American Idol (answer: no). When I come home from work, the garden is my relaxation. Then when it’s dark I can watch the shows I Tivo’d. Seems to be a common phenomenon! Not everyone is a Gardner. 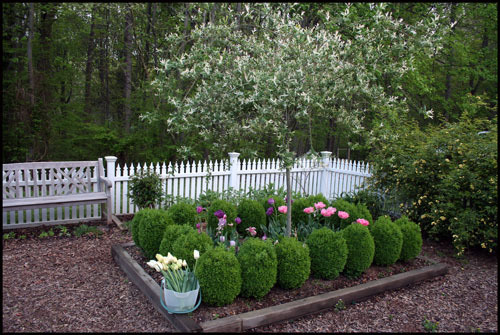 I am a born and raised Gardner and actually choose Landscape Design as my career. I love your gardens!!!! So lush. I garden to avoid housework. But seriously… this is a very thought-provoking post. I’ve never known why I garden. The garden is there and I like to be out in it. And then I start fiddling with things and pretty soon I’m gardening. Before I met garden bloggers, I never knew anyone else who was interested in gardening. So I tend to think an interest in gardening is the exception, not the rule. Love this article. It’s so true. My husband and I love gardening, but we watch American Idol too, thanks to TIVO. :o) HA! People just have different priorities I guess. I am also blessed with parents that garden like crazy, so they passed it on to me…another thing most people are lacking…someone to teach them how.